The settlement of Castello is perched among vine and olive groves above the village of Valdottavo and the Serchio valley, some ten miles from the historic walled city of Lucca. With medieval origins, the 20 or so houses have looked just as they do today for around 250 years, and most have been home for generations of Italian 'contadini' families. There is no shop or bar, and it is a haven of peace and tranquillity. A narrow road – with some interesting bends – winds up the couple of miles to Castello. You can visit the bars and shops in Valdottavo by strolling just 20 minutes down the ancient and pretty mule path, a reminder of the days – still remembered by older residents – when it was the only way of reaching Castello. 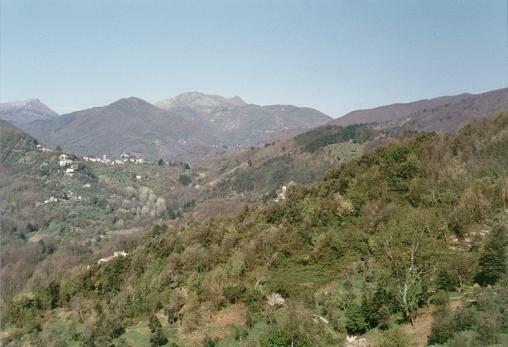 Facing south and west, Castello enjoys sunshine all day long, and the changing light through the seasons and the days provides a mesmerising variety of colours on the hills near and far. Scattered smallholdings on the slopes below offer the gentle activity of distant cultivation, while church bells ring out services from tiny villages in the folds of the surrounding hills. Paths bordered by all manner of wild flowers including rare orchids meander among the olives and up into the deciduous woods which cover the higher slopes. All who live in or visit Castello are captivated by its ancient Tuscan charm. 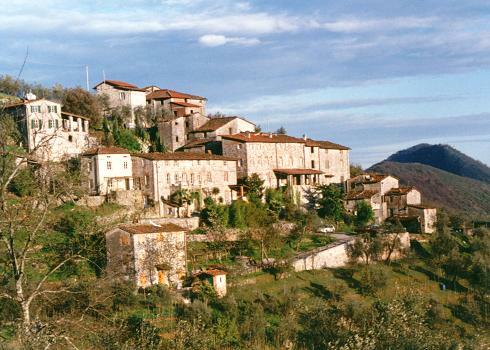 Most of the Italian resident families have a long history which is entwined with the hamlet. The little paths and mellow stone stairways allow you to explore, and perhaps meet some of the villagers, who are without exception courteous and friendly, not to mention the resident cats and dogs who lie undisturbed in whatever patch of sun or shade they choose. As you explore the picturesque and serene Tuscan countryside on foot or by car, you will discover perfect little hamlets to delight the eye: set amid the vines and olives which exemplify the culinary reputation enjoyed by this part of the world. And of all the views from these hillside hamlets none is so perfect in scale and balance as that which the fortunate people of Castello savour every morning when they open their shutters, and every evening as the sun sinks behind distant higher mountains. Our neighbour Giorgetta is glad to keep our house clean and tidy for our guests, and Arturo d'Olivo and his family tend our olives and vines on the slopes below – the wine he makes may be an acquired taste, but there can be no criticism of his home produced grappa which has a kick like the mules which were the only transport to Castello when he was a boy. This special place has found that life enhancing balance between comfort for our guests and the true daily life of a vibrant, working Italian rural community. Castello waits to welcome you with its soothing magic.